Just as South Korea’s new president Moon Jae-in was celebrating his election victory in May, South Korea’s unemployment rate hit a 17-year-high of 4.2%. Youth unemployment, which is far higher than unemployment overall, passed 12% at one point this year and stood at 11.2% in April. New figures for May are expected next week. Despite being a developed and fairly wealthy country, South Korea’s economy is tough on certain demographics, especially the young and the elderly. Now a survey from two widely-used Korean job application sites, JobKorea and Albamon, suggests that things are bad enough that, as their job search drags on, some Korean job seekers are more likely to skip meals to save money. More than 1,100 registered job seekers between the ages of 25 and 30 responded to the survey from the two sites (link in Korean), published June 8, about their eating habits. More than 80% of them said they skipped one or more meals a day, with many citing the economic burden as the cause. More than 16% of the people who took the survey reported only having one meal a day—the share was closer to 20% for people who described themselves as looking for work for six months to a year and for more than a year. 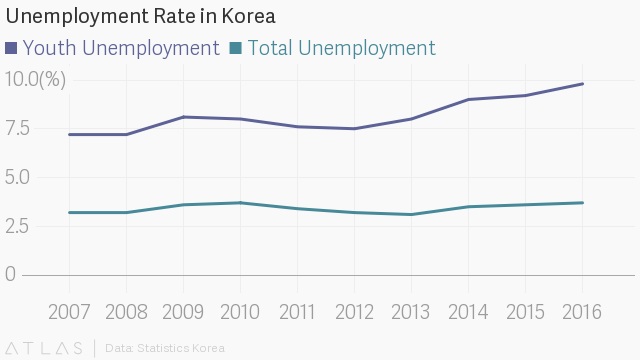 The unemployment rate among people age 15 to 29 has always been higher than for the population at large, but it has increased markedly since 2012, when Park Geun-hye, Moon’s predecessor who was impeached earlier this year, was elected. It is one of the many economic issues facing South Korea that president Moon has promised to tackle—clearly, that can’t happen fast enough.